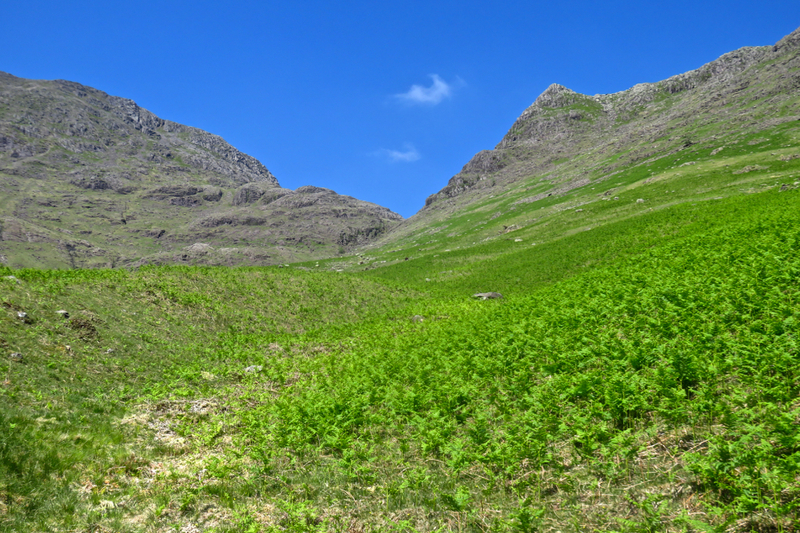 Walk 145: Crinkle Crags — in the sun! I haven’t been getting out on walks as often as I’d choose this year, as various other things (personal projects, train strikes, the weather, life) have been getting in the way. 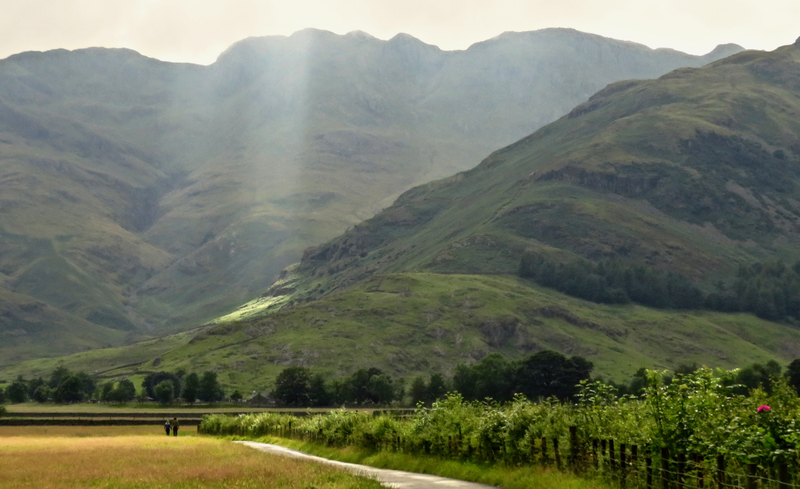 But yesterday, 12th May, was far too good a forecast to waste so I headed for Great Langdale and exorcised the ghosts of one of my wetter, colder Lakes experiences, namely walk 64 back in August 2012. 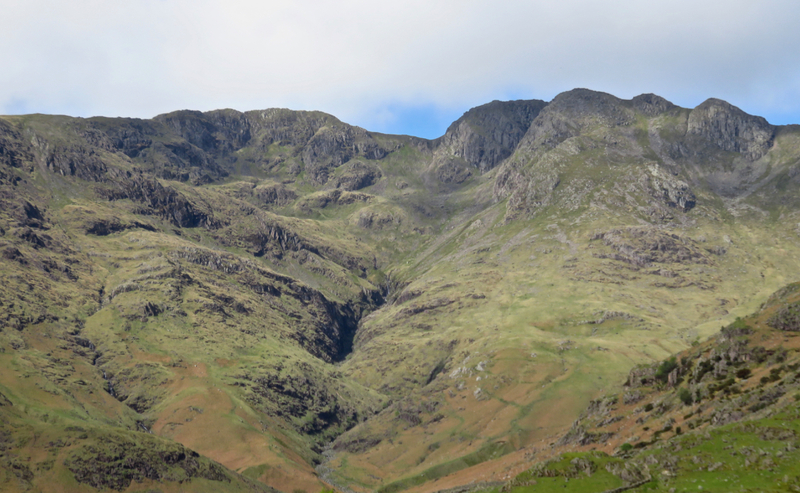 That walk ensured I would add Crinkle Crags to the list of ‘fells I really needed to go back to in better weather’ — but walk 145 certainly delivered that. 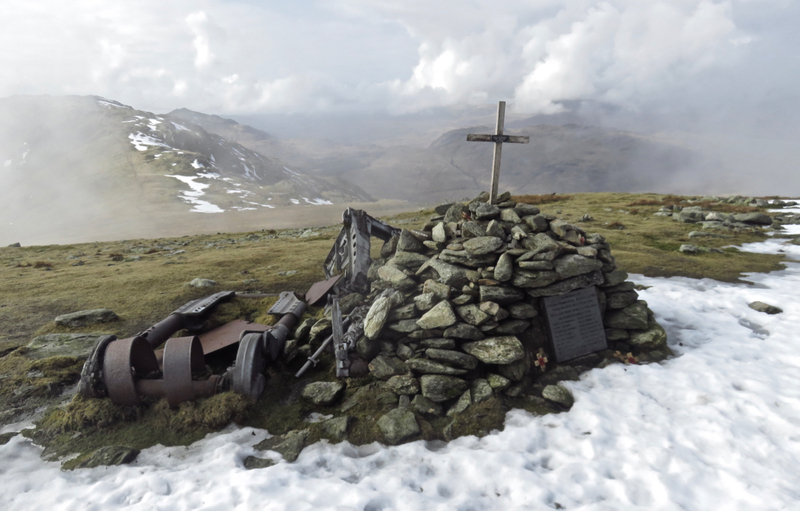 A fine, sunny day, but not too hot: ideal for walking and for bagging one of Wainwright’s ‘Top Six Fells’. Do I rank it that highly? Well, have a look at the detailed walk 145 page and see. 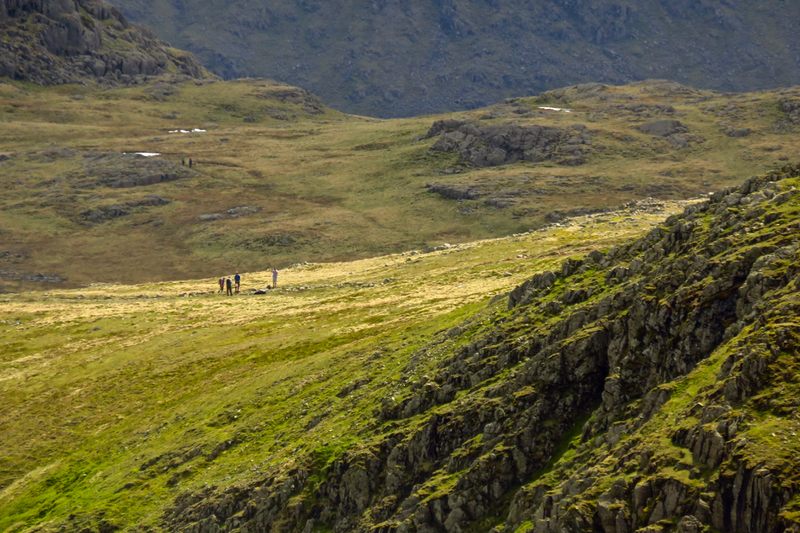 View through Mickle Door, the walkers are on the path coming up from Red Tarn. The logistics of this walk, and others ending at Dungeon Ghyll, have been made easier by a retiming of the buses back from there to Ambleside — there is now a bus at 15.05, instead of there being nothing between 14.05 and 17.05. This is far better for walkers and shows that someone, somewhere, may even be thinking about these things. 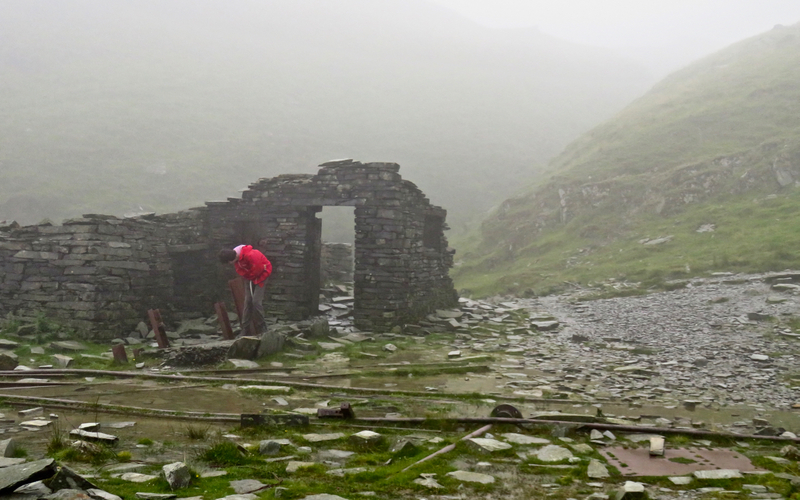 As of today, then, I have bagged 145 of the 330 Wainwrights on my second round, thus have 185 to go. The plan is to return in just over a week, 22nd May — weather permitting but we seem to be in a settled spell at the moment, so fingers crossed. 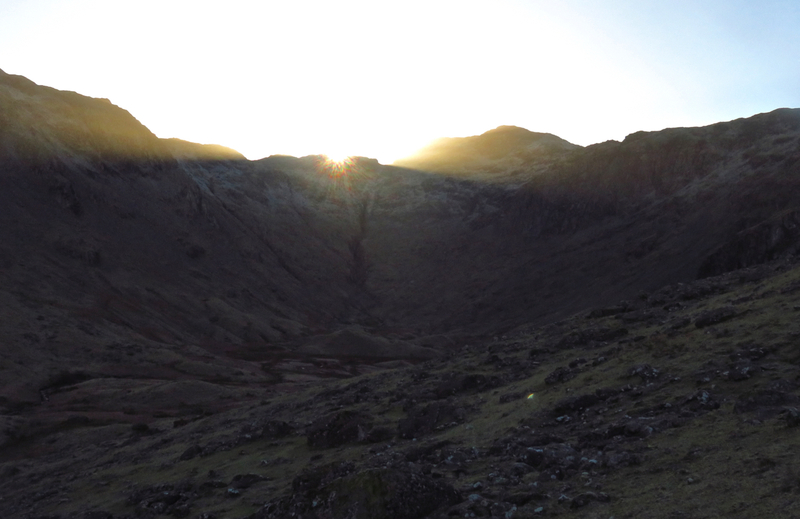 And it’s definitely time I went back to the Western Fells. At this time of year, it’s never easy to find a possible day for a walk, particularly outside a weekend, but Friday 25th November was booked in as a day off work weeks ago for various reasons. Even then however, late November is hardly a dependable time for weather — or at least, only insofar as one can depend on it being unpredictable. And yet…. 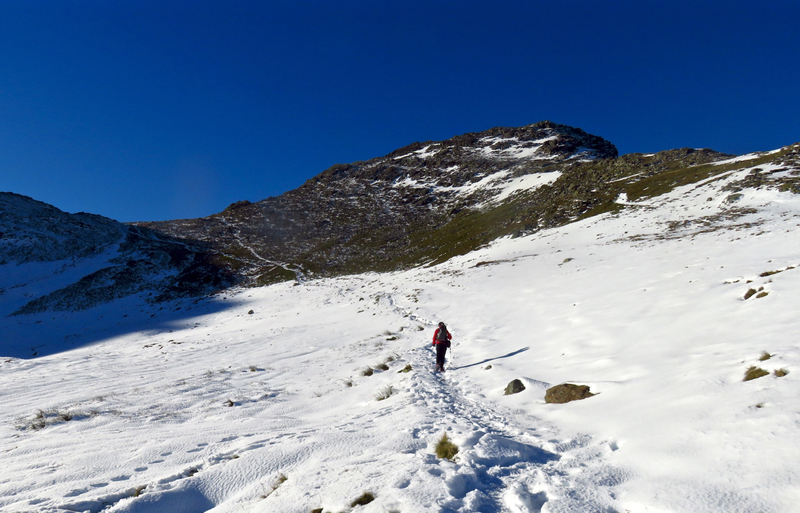 25th November 2016 might well have been one of the best late November days of my whole life, with still air and cloudless skies, though also snow and ice. 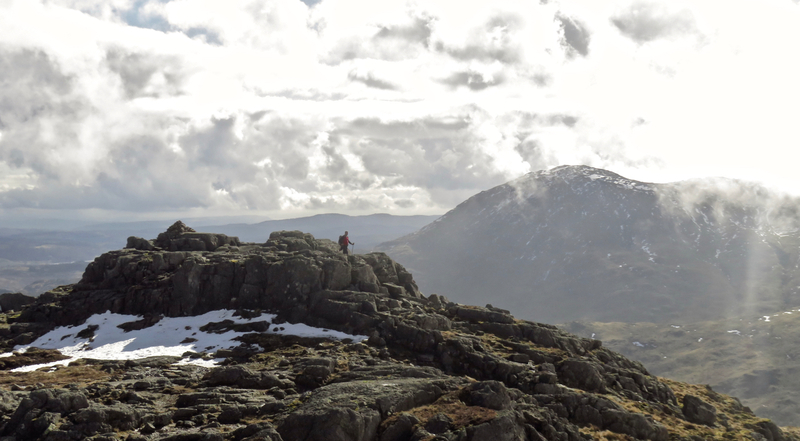 Either way, lucky me for being able to take advantage of it on walk 121 by going up Bowfell, one of Wainwright’s ‘Top Half-Dozen’, and justifiably so. 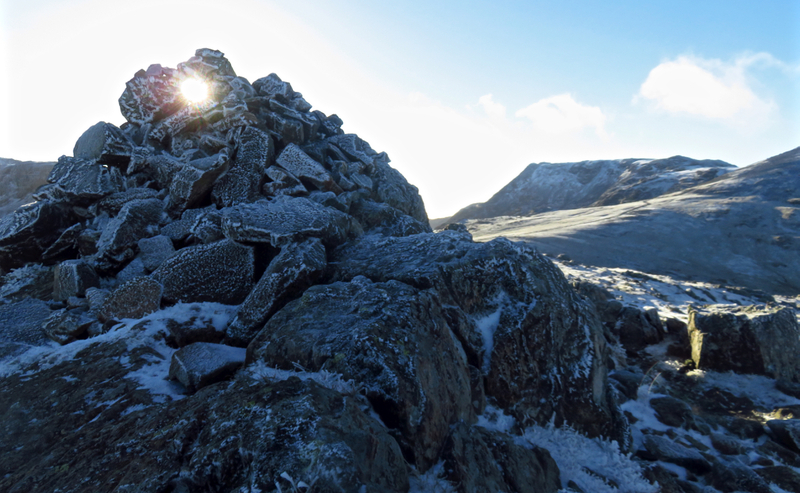 An excellent mountain, rocky and dramatic but not too arduous on the ascent, and with a spectacular view from the summit, one of the best. All a fine way to spend a Friday therefore. The Band. illuminated by the low afternoon sun. 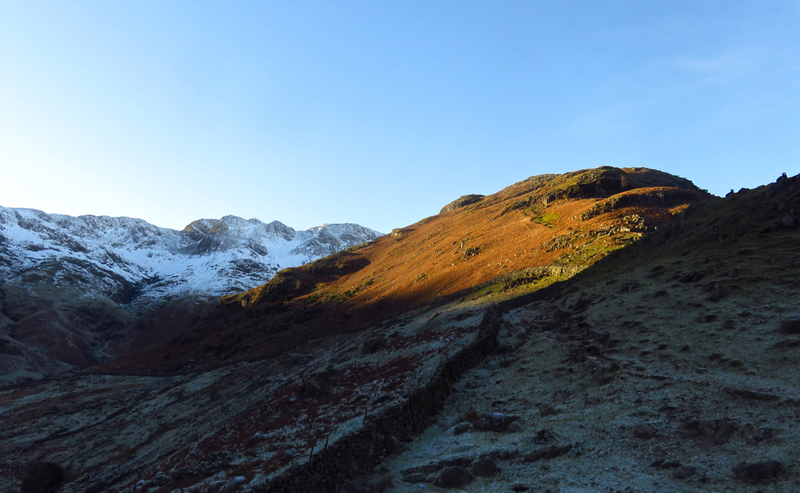 Crinkle Crags is (or are) in the background. For the details, do read the walk 121 page, which has the usual crop of additional photos. 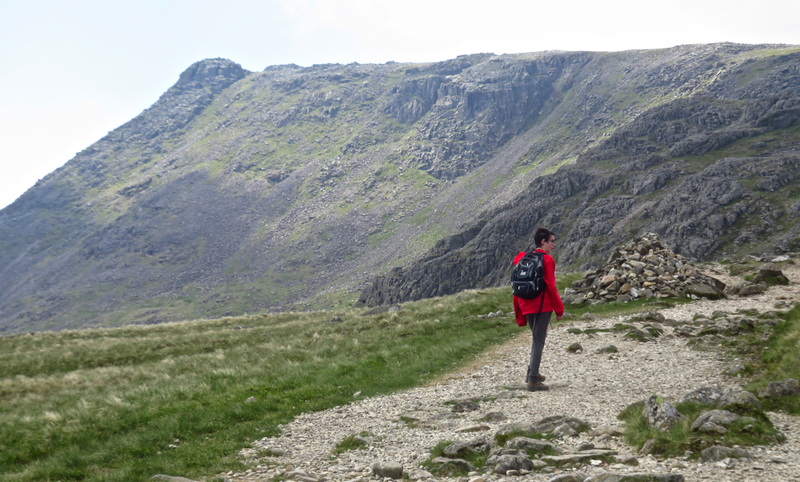 As of today, then, I have bagged 82 of the 330 Wainwright fells for a second time, thus have 248 to go. I might get one more walk in before or just after Christmas, but once again, that depends on the weather. Still, the dice came up all in my favour yesterday, so let’s see if they do so again.